Think of Mercedes' performance division, AMG, and there's usually one thing that comes to mind: big V8 noise. While the engineers at this go-faster skunkworks are increasingly encroaching on the territory of their arch nemesis, BMW's M division, with their ever more thrilling model-range, they have won fans the world over for years with their heavy-hitting powerplants, of which V8s in all guises – turbocharged, supercharged and normally aspirated – have featured heavily. Such is the importance AMG places on the distinctive bellow of its engines, that its boss, Tobias Moers, recently confirmed that he wouldn't consider an engine with less than eight cylinders for the new C63 AMG performance saloon. And it is this thinking that sees the new model imbued with the same thunderous voice as its stablemates, as the prototype model, recently caught testing at the Nurburgring, proves. While it may wear the camouflage so common on development cars, the hard-driven saloon is instantly recognisable as an AMG, thanks to the cultured racket blaring from its tailpipes. While the new motor may have dropped in size, down to 4.0 litres from 6.3, it has gained a brace of turbochargers, and is expected to develop 470bhp – more than enough, as we're sure the Jaguar F-Type driver in the video will testify. 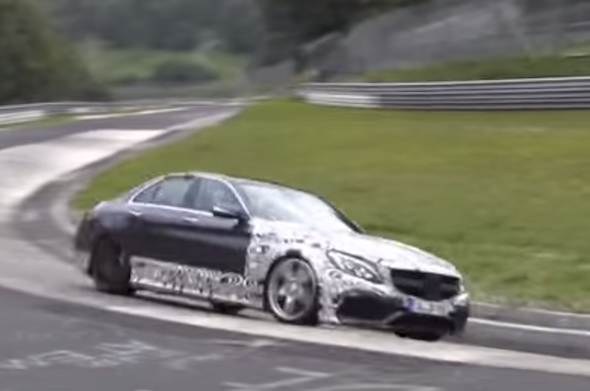 Click play below to see the new C63 in action.